100% Cotton + 100% Comfort = Dio Boxxer! Dio Boxxer, for the discerning boxer wearer who doesn't buy underwear in a three pack. Our 100% cotton boxers are designed to be an instant favorite: roomy full cut boxer shorts with a one-piece back and a soft fully fabric covered elastic waistband. 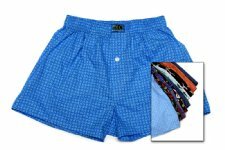 In addition, we craft plenty of "wearing ease" into all our boxer shorts to ensure that you will enjoy them for a long time. We then field-tested our designs on trusted friends, to ensure compatibly with your active lifestyle. Cut and sewn in the U.S.A.
© 2008. Dio Fashion, Inc.
Dio Boxxer is a registered trademark of Dio Fashion Inc.